Leading flight search engine, Skyscanner has recently reported an increase by 53% in flight search to European destinations this year. 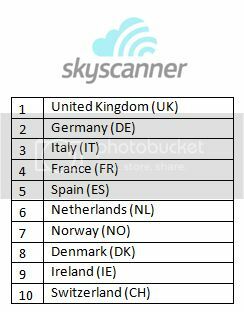 Following the decision to lift the ban on Philippine Airlines by unanimous votes among the European Commission’s 28 member states, Skyscanner also revealed top destinations of choice among Filipinos. Topping the list of most searched destination is the United Kingdom. With an estimated Filipino population of 200,000 in 2007, UK has been a favourite destination not only for its rich culture and castles but also for the visiting families of Filipinos working there. Coming in second is Germany, famous for its rich culture, mouth-watering cuisine and people who know and love a good party. In fact, Filipinos travelling this great country date back to the 19th century and our National Hero, Dr. Jose Rizal is one of them. Filipino’s penchant for fashion, food and discovering interesting spots made Italy the third on the list. “We Pinoys love to shop, eat and go sight-seeing. So a country that offers all these definitely plays a part when we decide to travel,” Janet Ranola, Skyscanner Philippines Manager explains. “Plus the fact that a lot of Filipinos are working and are scattered in Europe, flying at cheaper rates is great news indeed,” Ranola added. “Now that Filipino travelers can fly to Europe without having to catch connecting flights and such, I think online search and inquiries to more European destinations will increase” Ranola concluded. Other destinations that made the top 10 list are France, Spain, the Netherlands, Norway, Denmark, Ireland and Switzerland. For more information on cheap flights, deals and where to go in Europe visit www.skyscanner.com.ph.